August 29, 2016, 8:52 AM · SHANGHAI -- The results may already be in, but there was plenty of wonderful music Monday in the second day of the Mozart semi-finals at the Shanghai Isaac Stern International Violin Competition. Andrea Obiso of Italy played interesting cadenzas that had bariolage, harmonics, and even a few Paganini-like flourishes in the first movement, and a sensitive and artful cadenza in the second movement. But his violin was noticeably sharp in comparison to the orchestra for the entire performance, and this unfortunately distracted from otherwise excellent playing. Elvin Ganiyev of Azerbaijan, was among the younger of the contestants at age 19. I enjoyed what seemed to be some Eastern influence in his first-movement cadenza, though in general his cadenzas needed more direction and something to relate them more to the material in the Mozart. He had a nice vibrato that he could use more consistently. Wendi Wang of China played with good intonation and bow control, though definitely on the forward edge of the beat. Her cadenzas needed some glue to hold the ideas together. The first cadenza seemed in a different world from Mozart; by contrast, the second-movement cadenza was completely related to the Mozart material, nicely composed and consonant. It left me a little confused about what musical personality she was trying to convey. Sergei Dogadin of Russia played in a relaxed style, with good dynamic contours and no over-playing. His first-movement cadenza was creative and varied, traveling to different keys but still predictable in certain Mozartian ways. His Mozart kept to the Classical, rather than getting overly Romantic. 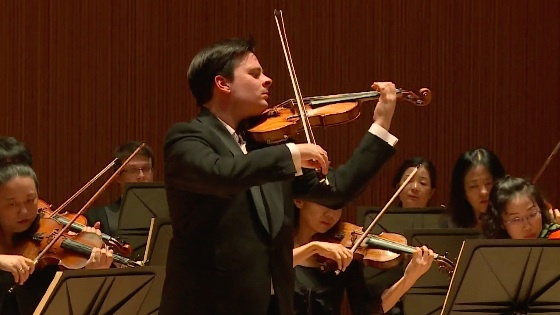 German violinist Stefan Tarara's good-natured performance began with the first orchestra tutti, which he played with gusto along with the orchestra before his own solo entrance. He, like many but not all others, started the concerto on an up-bow, which works quite well. His first very short cadenza was effervescent; the second one began by repeating itself, as though it was turning around and deciding where to go. And then it went to some fun places, with references to a number of violin solos (including, I believe, the Butterfly Lovers Concerto that semi-finalists played earlier in the competition) and this actually made audience and jury laugh audibly. It made a lot of sense -- an improvised cadenza ought to take into account its audience and occasion, and in this case the audience is a lot of violin lovers on the occasion of a competition. He did something similar in the second movement, trotting out different styles and references, and I felt certain that Mozart himself would have approved of this kind of humor. With Tarara playing many of the orchestral tuttis, he and the orchestra also were more together during his solos. It was a vigorous and delightful performance. Ming Liu of China gave a strong and intense performance, with notes well in hand. Her cadenzas adhered pretty strictly to the material, with tasteful variations, a variety of techniques and good direction. Her third movement was solid with good energy in her sound. 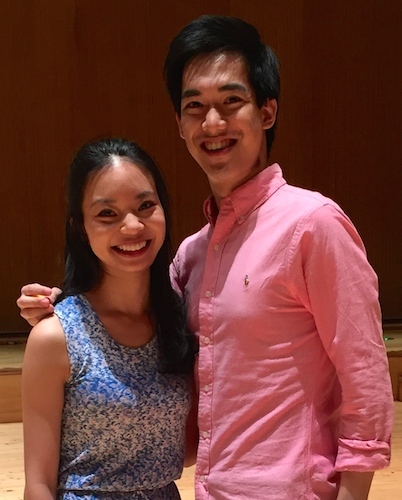 The last two performers of the day were both from the United States, Richard Lin (who studied with Aaron Rosand at Curtis and Lewis Kaplan at Juilliard) and Sirena Huang. Americans Sirena Huang and Richard Lin. Lin played a strong performance with tasteful and well-composed cadenzas, but probably the highlight was the second movement, which had nice direction and just a lovely sound. Huang had a pure and appealing voice, with cadenzas that were structured thoughtfully and well-delivered. A few hours after the conclusion of the Mozart performances, the finalists were announced: Mayu Kishima, Sergei Dogadin, Stefan Tarara, Ming Liu, Richard Lin and Sirena Huang. Finalists will perform on Sept. 1 and 2, after which the prizes, including the record-breaking $100,000 First Prize, will be announced. They are required to play a major concerto and a virtuoso piece for the Finals. August 29, 2016 at 08:07 PM · Hi Laurie, thanks for the news updates! They are very interesting to read/watch. Which Mozart 3 performance was your favorite? August 31, 2016 at 05:46 AM · I felt that there were so many fantastic performances, and usually I would not pick a favorite but I felt that Stefan Tarara gave a real stand-out performance on so many levels. First, he had a good day and played well, but also the way he composed the cadenzas for the audience was really delightful, and it was just lovely violin-playing. But always keep in mind, this is just one round of many that these violinists had to play, and different people have different strengths that come to the fore in each one. In the first round they had to play virtuoso stuff: Paganini, Bach. Then in semis, do a chamber piece, the Butterfly Lovers (easier technically but more difficult to get the proper Chinese feel and really "sell" that), a sonata, then Mozart in this round, with self-composed cadenzas. Quite a lot.